Amaranth leaves (Chauli/Thotakura) are much loved in our home and take the form of stir fry, dal and stew in our daily meals. In recent past, I have used these nutritious greens along with chick pea flour (besan) to prepare fritters. They are easy to make, work great as appetizers for parties and also make for a wonderful tea time snack. 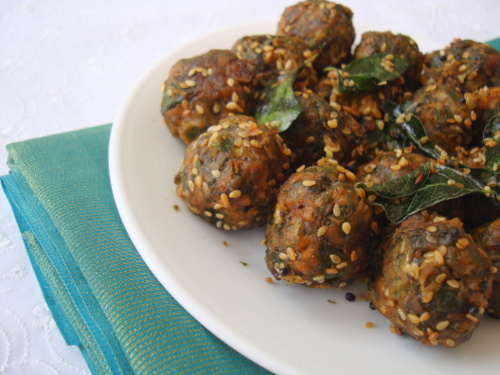 These vegan crispy green leafy balls taste best when warm. Try them the next time you bring home some amaranth greens and you’ll want to invite your friends just to serve them a perfect finger food treat. 1 In a bowl, add the chopped amaranth greens, green chilles, ginger-garlic paste, red chili powder, cumin seeds, besan and salt. Add little water to make a dough such that you can make small balls. Make small balls and keep aside. 2 Heat oil in a deep frying vessel. Once its piping hot, reduce flame to medium and drop the balls gently into the oil and fry them to a golden brown color. Deep fry a batch of 8-10 balls depending on the size of the vessel. 3 Heat 2 tsps oil in a pan, add mustard seeds and allow to splutter. Add sesame seeds, red chilies, hing and curry leaves and saute for a few seconds. Add the balls to the pan and mix well. Turn off heat and sprinkle fresh grated coconut. 4 Serve warm with a cup of masala chai. Crispy balls looks fabulous, love to munch some. Super crispy snack… love the color and also the sesame crust! Thotakura garelu telsu.Ivi kuda try chestanu.Thanq sailu. can u please tel me wat is amarnath leaf?im a tamilian.how does it look? Here’s a picture of amaranth leaves. Very new recipe and looks tempting & delicious sailu …. Super!! I never know that snacks could be made this easily 🙂 Thank you very much!!! Please mention the measurement for besan. Is it 1/2 cup?? It depends on the amount of leaves used. I have eyeballed the besan quantity, add 1/2 cup and if required add a little more. Sailu, your recipes are all so clear and you have so many unusual combinations of food. I would never have thought to do something like this with thotakura. Thank you! I am amazed you don’t have more followers. I chanced on your website today as I was looking for ways to use gongura. My daughter loves gongura in any form. Hi Sailu, I have been following your recipes for a while now but never posted on your website. I think this is a great idea for making kids eat greens…I am always looking out for new recipes and your website is the place for it !! Keep up the good work. Great. it was too good .. and easy too…..